Which creature is the deadliest? Is it the insect that bites, the ostrich that kicks, the snake that squeezes, or the shrew that paralyzes? Is it the most venomous, the most poisonous, or the one that infects its victims with a fatal disease? ★ "The animals' pitches are perfectly tuned to fascinate (and frighten), and Spirin's characteristically rich and detailed artwork doesn’t shy from showing these predators doing what they do best." ★ "Together, the intriguing facts and the mesmerizing artwork create a lush book worth poring over again and again. 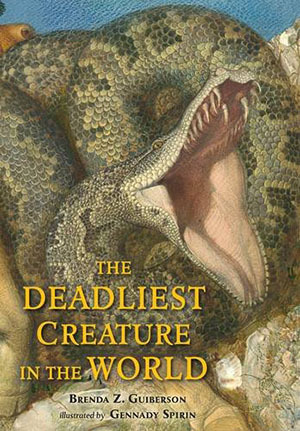 Young animal enthusiasts will find this to be a wonderful introduction to some of the world's most frightening creatures"
"Each narrative will hold readers' attention with its boastful delivery and lethal details."